We have had a further exchange with officers of Ironworkers Local 86. You were removed as a member of your organization? Is this not true? But still you have the adousity to call out our local? “I was expelled for helping lead a wildcat strike of some 2,000 members against a sweetheart contract that we didn’t even have the right to vote on. The membership of my local consistently voted against the charges, which were brought by the International. Several hundred showed up to protest at the hearing on the charges. Several years later, the rank and file presented me with a plaque, saying that they considered me to be their brother. Our wildcat strike was similar to but a lot larger than the Ironworkers wildcat strike in SF a few years back. Top: John Reimann (holding plaque) with his brother carpenters. 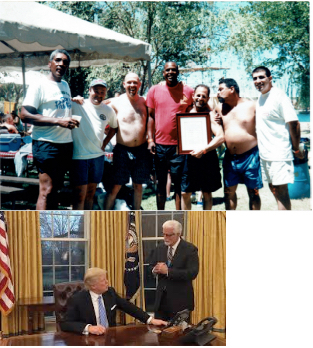 Bottom: Carpenters General President Doug McCarron with Trump. We all must pick a side. We are told that the carpenters in the Seattle region just voted down a proposed contract. This is a huge step forward. Congratulations to those carpenters! We hope to have more news on this soon.